Along with sheep, I love goats. I also love burlesque. So they had to come together at some point and they did in a large-sized piece titled, ” Kickin’ Nannies All Star Goat Show“. I like the little goaty-guy that is holding up the signs. This original artwork is sold and lives in a happy home, but I wanted to share it. 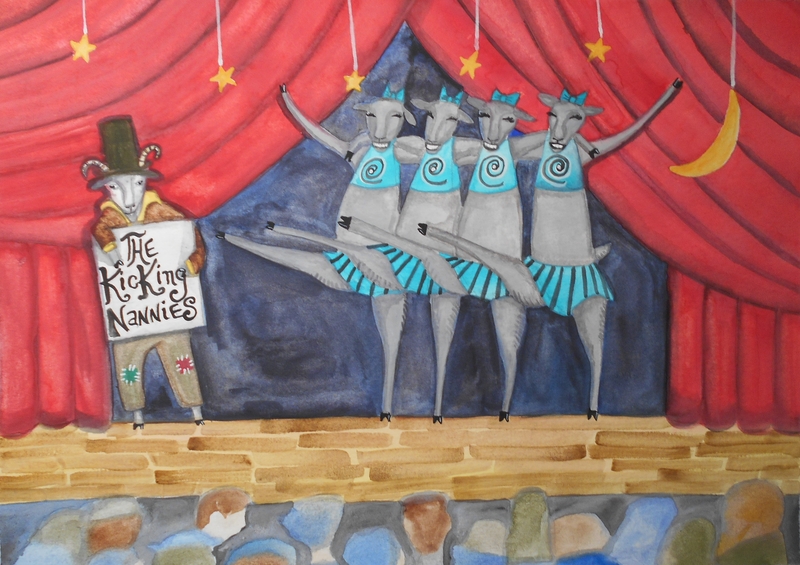 There are also limited edition prints of the Kickin’ Nannies available for $25. Finished this 8 x10 watercolor painting. First let me cover what this painting is NOT about based on some of the emails I’ve been getting. It is not about depression or anyone that is depressed. I thought of this painting, I did this painting and no one more than me knows the intention of this painting. It is about people who choose to not embrace the things they have and only lament the things they don’t have. I don’t make fun of people struggling with anything. I have a very dark sense of humor but not a cruel one. Depression isn’t funny. This painting is about the people who choose to be the negative, unappreciative asshats of the world, not anyone that struggles with depression. I have nothing but admiration and compassion for anyone fighting that demon. We cool now? Good. I like it when we’re cool. If you want to buy this piece, I am sorry it is sold but you can get something similar as a commission for $50. [update] this piece was purchased and will be part of a silent auction to raise awareness for domestic violence. I wish I would have know the intention – I would have totally donated it! I love Reddit. It’s one my fave places on the Internet. I wind up reading Reddit/Relationships – I know a lot of trolling goes on there but some legit sharing too. I read one very detailed and long post from a woman telling about her life with a verbally abusive man. The yelling and tantrums, just wow. People were commenting to her, why don’t you just leave? She wasn’t in a position to do that financially. She had no job, no support systems, he’d driven off all her friends long ago, no car,no savings of her own he didn’t have access to, and she had a young child to think about. She also feared him because he said he’d disappear with their child on the first visitation. She said he was so charming when wanted to be, he would indeed fool a judge into visitation. The most shocking part of the entire post I read, was the number of other women in a similar situation. They didn’t have physical bruises but they were verbally abused frequently by the person that was supposed to love them. I have no fond memories of childhood. One way or another my mother managed to destroy them all with actions, words, and usually both. Childhood is long over and I let any animosity I have for my mother go an equally long time ago. It is what it is and it just made me resolve to be supportive of my own kids. I definitely fine-tuned the art of finding a silver lining in any situation. I was thinking the other day, when I remember any event from being a young child, it’s always in shades of red and brown in my mind’s eye. I wonder why I don’t just remember things in regular colors as they were. Clearly i was not living in a red and brown world. Weird. That’s what this improved photo was about. This gentleman thought the cockroach was under-utilized as a resource. Why he had found ways to cook them, create fizzy softdrinks that only tasted a bit roachy, and he found the nice, large cockroaches made stylish ascots to wear. Alas, no one remembers this usefulness about cockroaches.